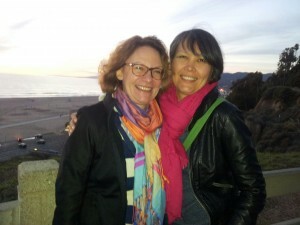 My name is Vivian and I am a supporter of this great photographic project. I will be writing here regularly to give you a special insight into the project and related topics. The team members will provide you with information about their work and explain the photographic techniques used. We will interview the mentor of this project, the shaman Angaangaq Angakkorsuaq, and find out more about how Greenlanders live and think about the melting ice shield. If you have any comments or questions for the team or are interested in a specific aspect, please feel free to contact us. We’d love to hear from you. Yesterday was the final day of the first major international Stella Polaris* Ulloriarsuaq Exhibition. This had opened December 13 2014 at the Leica Gallery in Los Angeles. 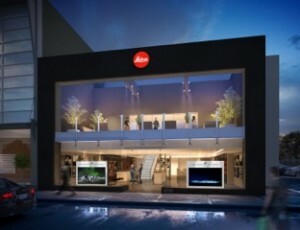 Many thanks to our friends at Leica for their support in making this exhibition so successful. A tense time lay behind the team preparing for the event. 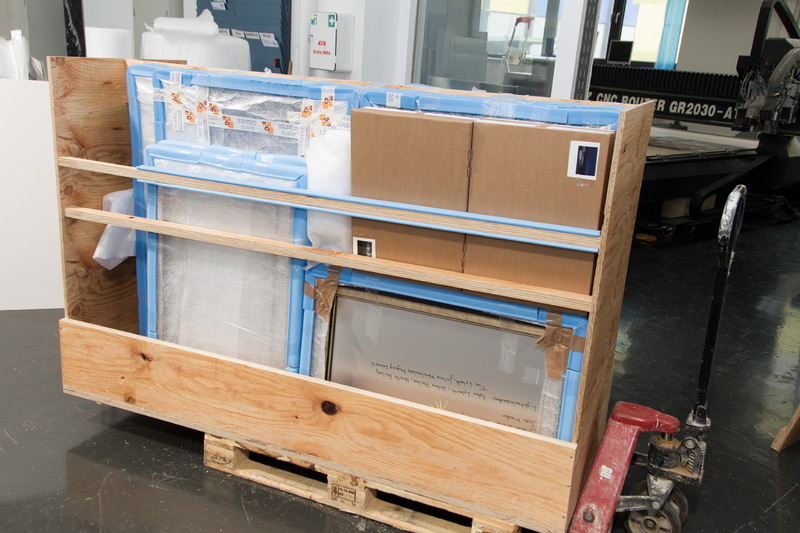 The production of 30 gallery exhibits in museum quality at Chromeart (some of which you can see on our homepage), the crating, filling out endless customs declaration forms and the transportation by airfreight was quite a feat. The team heaved a huge sigh of relief when the boxes were finally outbound to LA with a stopover in London. Imagine the distress when the news came through that the pictures went missing at Heathrow airport. 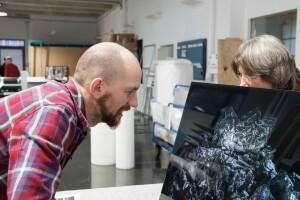 This ’breathtaking moment’ lasted almost 4 days and nights until the exhibition was located – in the wrong storage space due to a logistics slip-upIn the end the pictures arrived at the last minute in LA and with the help of Leica Gallery and compassion on the side of LA customs, the pictures were hung one day before the big event. On the opening night a big slab of ice was positioned before the central staircase and gave guests a tactile introduction to the ice theme. 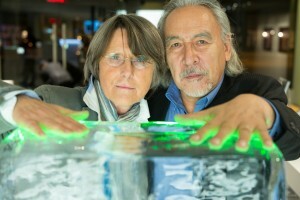 Nomi Baumgartl, initiator of the project and photographer, and Angaangaq build up an aura of green light between them and the ice. Angaangaq Angakkorsuaq, mentor and shaman who came especially from Greenland, graced us with a special blessing and spiritual description of the work that brought tears to the eyes of the visitors. Angaangaq Angakkorsuaq, shaman, healer, storyteller and carrier of the Qilaut (winddrum), is an Eskimo-Kalaallit Elder whose family belongs to the traditional healers from Kalaallit Nunaat, Greenland. His engagement for the Environment and Indigenous issues brought him to more than 60 countries in the world. He has supported and accompanied the project from the beginning. 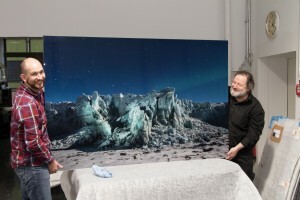 Yatri N. Niehaus showed a short version of his documentary film Stella Polaris* Ulloriarsuaq which captures the Light-Art-Project in Greenland from beginning to end in portrait-style. 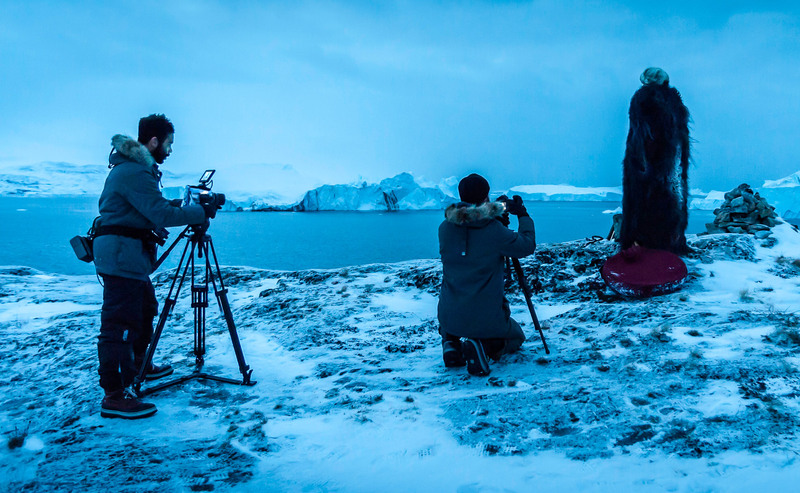 Besides the fascinating shots of Greenland’s unparalleled glaciers and icebergs, Yatri interviewed Greenland’s Light- ambassadors, who have much to say to the world about the disappearance of the “eternal” ice. See a short version on our website.